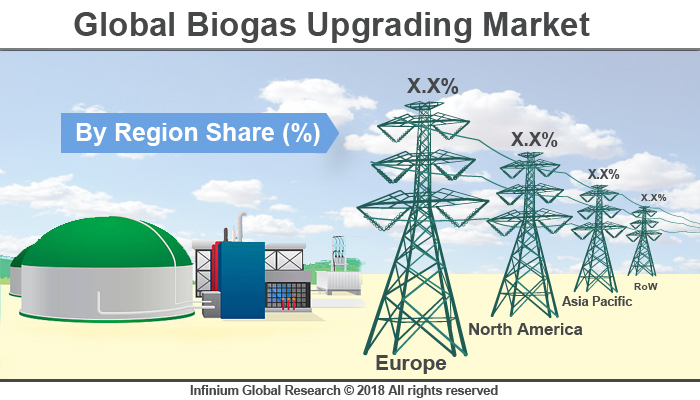 A recent report published by Infinium Global Research on biogas upgrading market provides in-depth analysis of segments and sub-segments in global as well as regional biogas upgrading market. The study also highlights the impact of drivers, restraints and macro indicators on the global and regional biogas upgrading market over the short term as well as long term. The report is a comprehensive presentation of trends, forecast and dollar values of global biogas upgrading market. According to the report the global biogas upgrading market is projected to grow at a healthy CAGR over the forecast period of 2018-2024. Biogas is a biofuel that is naturally produced by the decomposition of organic matter. Naturally obtained biogas produced, contains 60% methane and 29% carbon dioxide with trace elements of Hydrogen Sulfide. The corrosive nature of Hydrogen Sulfide can destroy the internals of a plant. The use of biogas upgrading processes removes the contaminants in the raw biogas stream leaving more methane per unit volume of gas and using it as fuel gas for machinery. The energy content of biogas is in direct proportion to the methane concentration and by removing carbon dioxide and Hydrogen Sulfide in the upgrading process, the energy content of upgraded biogas becomes comparable to natural gas. The rise in demand for alternative transportation fuel and organic waste management are the major driving factors for the growth of biogas upgrading market. The gases methane, hydrogen, and carbon monoxide (CO) present in biogas can be combusted or oxidized with oxygen. This energy release allows biogas to be used as a transportation fuel in a gas engine to convert the energy in the gas into electricity and heat. However, the upgradation in the biogas plant increases the cost of biogas which acts as a challenge for the growth of biogas upgrading market. Moreover, the rising environmental concerns and exploitation of biogas as a transportation fuel are expected to increase the growth of biogas upgrading market. By geography, European regions hold the largest market share in the biogas upgrading market. North America is one of the fastest growing biogas market owing to the developments in the renewable energy sector. In addition, Asia Pacific countries like India, China, and Japan are also expected to gain rapid development in the global biogas market owing to the stringent government regulations in reducing the carbon footprints. The report on global biogas upgrading market covers segments such as technology. On the basis of technology the global biogas upgrading market is categorized into water scrubbing, pressure swing adsorption, selexol adsorption, amine gas treating, and membrane. The report provides profiles of the companies in the global biogas upgrading market such as Air Liquide, CarboTech, Cirmac, Flotech Sweden AB, Gasrec, GtS, Prometheus, Xebec (QuestAir), Malmberg Water and MT-Energie. The report provides deep insights on demand forecasts, market trends, and micro and macro indicators. In addition, this report provides insights into the factors that are driving and restraining the global biogas upgrading market. Moreover, IGR-Growth Matrix analysis given in the report brings insight into the investment areas that existing or new market players can consider. The report provides insights into the market using analytical tools such as Porter's five forces analysis and DRO analysis of biogas upgrading market. Moreover, the study highlights current market trends and provides forecast from 2018-2024. We also have highlighted future trends in the biogas upgrading market that will impact the demand during the forecast period. Moreover, the competitive analysis given in each regional market brings insight into the market share of the leading players. This report will help manufacturers, suppliers, and distributors of the biogas upgrading market to understand the present and future trends in this market and formulate their strategies accordingly.